The backside of Paris on Ponce is in full bloom thanks to artist Louise Chen, who goes by the name Ouizi. Instagrammers along the BeltLine can stand under the immense flowers looking almost insect-sized under the towering blossoms. In August, Brandon Sadler, a.k.a. 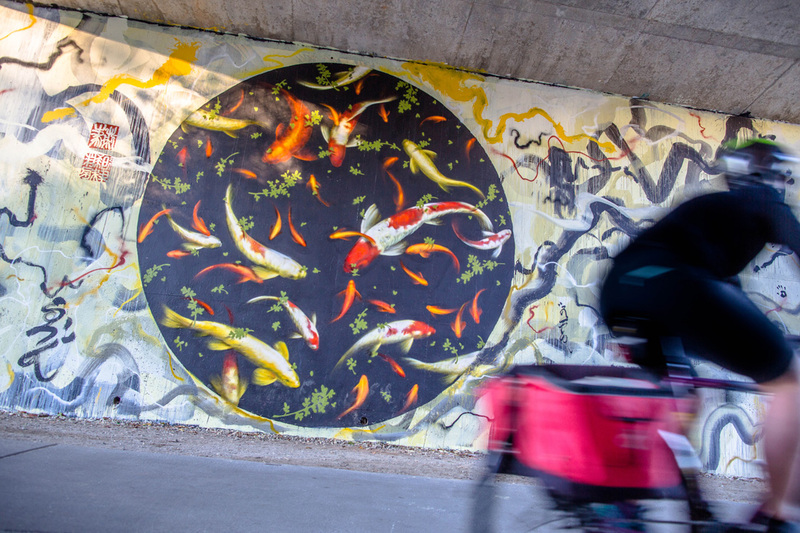 Rising Red Lotus, painted over his popular goldfish mural under the Virginia Avenue Bridge on the Eastside Trail. The new mural, titled “A New Light Shines Beyond the Darkness,” depicts giant koi fish swimming inside a circular black background. Sadler describes the new work as “controlled chaos where you find solace in the center.” Crowds are often seen marveling at the realistic fish, a reaction that makes this piece particularly close to Sadler’s heart. “My value gets placed on how [the art] makes other people feel,” he says. 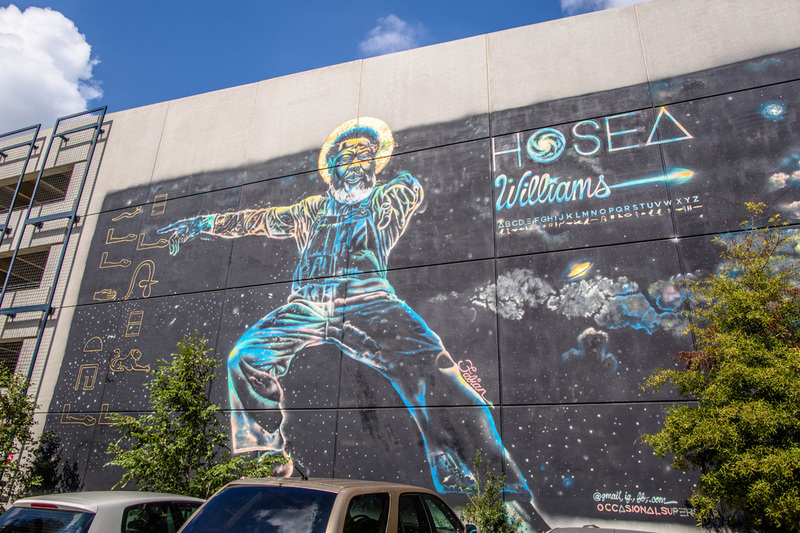 Artist Fabian Williams, otherwise known as Occasional Superstar, painted a 60-foot-high glow-in-the-dark Hosea Williams on the side of Old Fourth Ward’s Studioplex. The civil rights leader and activist sports bare feet and his trademark overalls. A halo hovers above his afro, and Egyptian hieroglyphic script runs down the side, along with a key to help onlookers decipher its message. To commemorate Atlanta entertainer Mike Geier’s run on the 2017 season of “America’s Got Talent,” where the 6-foot-8 entertainer sang in character as a melancholy clown called Puddles Pity Party, Grant Henry, owner of the quirky Old Fourth Ward bar Sister Louisa’s Church of the Living Room and Ping Pong Emporium, commissioned a dramatic mural of Puddles Pity Party’s likeness. 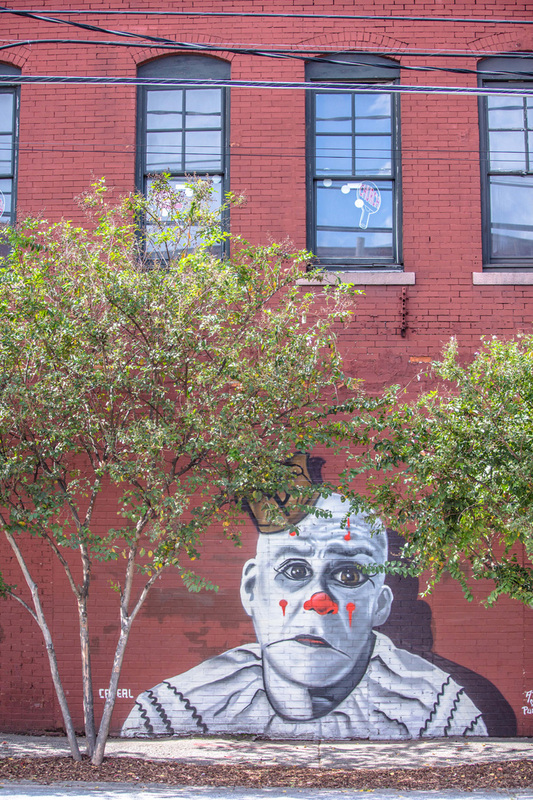 Artist Chris Veal accurately portrays the giant, frowning clown in a mural overlooking the intersection of Edgewood and Boulevard. Illustrator and painter Jake Llaurado is known for his “Funky Buddha.” He brings smiles to all those training their minds on the present moment with his Little Five Points version. Buddha emanates goodness, wearing flip-flops and flashing a peace sign to all who pass by.